Showing one’s teeth doesn’t always mean they’re smiling for the camera. Animals tend to expose their teeth especially when it comes to territory and lack of food sources. The fight may end up harmless, but sometimes also very brutal. The opponent may bleed to death and this may seem merciless to us, but that’s how nature occasionally works. As a matter of fact, we tend to describe a merciless fight between humans as animal-like. Taking close-up pictures like these can be highly risky, as animals don’t like any hindrance during their combats. For whatever reasons they may be fighting, this can injure the person or animal coming between them. Today we have come up with some dazzling shutterbug shots to inspire you and take you on a walk with us through the wild side. Enjoy with us some spectacular animal fighting moments! Fighting Kittens and Red Panda Fight are pretty funny. Stunning photos, thanks for the round-up. I didn’t realize how dangerous it was to for a photographer to watch two animals play fighting from the outside of a zoo enclosure. Thank you for warning me next time we trek to the wilderness of the SF Zoo. 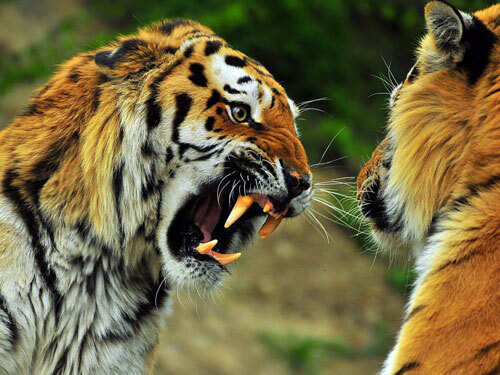 Wow, awesome photos, that first tiger looks possessed. I love “Roaster Fight”, Amazing Photography which has really exact timing and moment. really amazing pitures. thanks for that collection! What an amazing collection! these photos are very beautiful and frightful as well, thank you! Once more, great shots. I like your photography posts, they are amazing. OK, who else mimicked the red panda pose? RARR! Great pics!! Thanks for the share!! Striking shots! They’re so fantastic and realistic! Wild animals are fearful and beautiful at the same time.